I've been putting off this announcement; I know it will disappointing to many of you loyal followers of Your Daily Dose of Sabino Canyon. I'll post here for the last time on 7/7/2017. As many of you know, I've been juggling various part-time jobs this year and have been in Sabino Canyon very infrequently. (I need to be gainfully employed for at least another decade and don't want to move from Tucson.) Being a substitute teacher in the local school district was a great learning experience - and it made me realize that I need to be in the classroom again. I'm thrilled I was able to use math and science credits from my undergraduate days (now more than thirty years ago, but who's counting?) to become a middle school science teacher for the 2017/18 school year. The state of Arizona has a program whereby qualified candidates can teach while taking classes to get a teaching certificate. (My PhD doesn't qualify me to teach at the K-12 level.) I'm very fortunate to be able to take advantage of that program, of course, but it means I'll also be going back to school on top of teaching full time. Bottom line: I'll no longer have time for this blog. The good news is that I'll keep paying for the url http://www.sabinocanyon.net/ for at least the next few years (and probably until I retire. I may be back :-) That means you can view the archives (i.e., every daily post from the past 7 years) at any time. 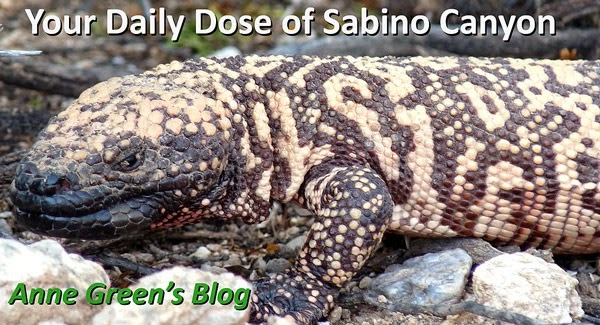 I know it's more trouble than getting an email every day, but if you bookmark http://www.sabinocanyon.net/ - you'll be able go to the site quickly. You can search the site via the 'search this blog' field, too. There's always Ned Harris' amazing flickr site, of course. I recommend bookmarking that and spending a happy hour or two there on a regular basis. This blog wouldn't have been possible at all without the support of my mentor and friend Ned. I am so grateful for his encouragement, generosity, and photography. Thanks, Ned! Thanks, too, to Gayle, Nancy, Patricia, Marty, Fred, Jean and Mark, Gene, and, as always, my Honey-Matt. It's been a great 7 years! I hope you can say that this blog brightened your day every now and then. Happy trails!